Many travellers I met in Ecuador and Colombia gave northern Ecuador a miss. And I get it – you’re on a budget, time is tight, you gotta prioritise. 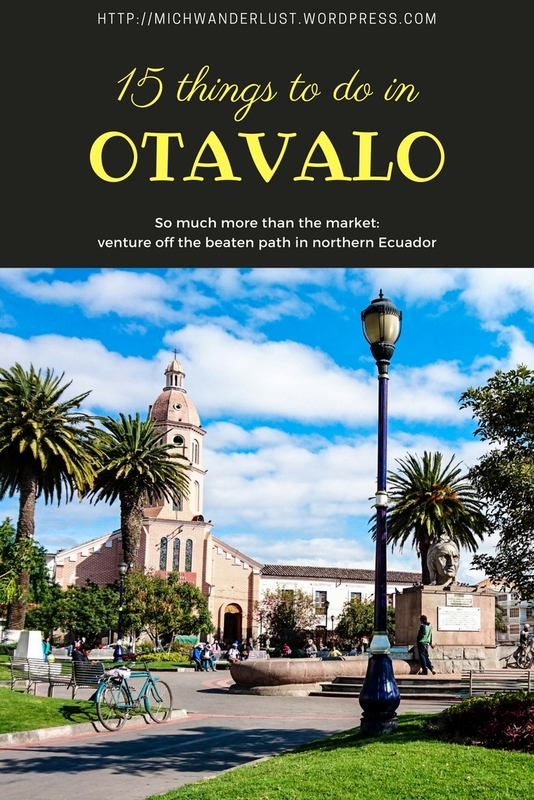 Or maybe you’re just thinking about visiting Otavalo on a day-trip from Quito. Actually, there is plenty to keep you occupied – if you’re into nature and culture, you’re in for a treat. Here are 15 things to do in Otavalo! 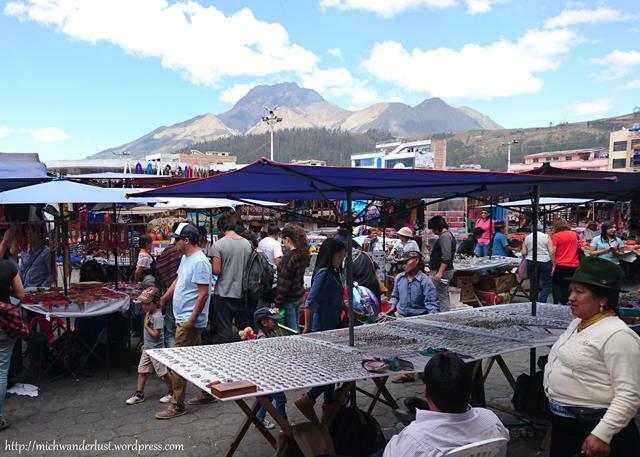 The largest indigenous market in South America – come on a Saturday and you’ll see the market at its height, with stalls spilling over into the surrounding streets. You can find pretty much anything that comes to mind when you think “crafted goods” – garments, blankets, jewellery, musical instruments, down to souvenirs like magnets and bookmarks. While I got my magnets and bookmarks here, I’ve heard a lot of the goods are mass-produced and/or made from synthetic materials. I got woven goods from Museo Otavalango and Miguel Andrango’s workshop, further down the list. How to get there: The heart of the market is the Plaza de Ponchos, a few streets down from the bus terminal. When you exit the terminal, turn right (past a bakery on the right-hand side of the street). When you hit the 3rd junction, look to your left – you should be able to see the stalls from there. If not, just head in that general direction and look out for the stalls. It’s a small city! Take care of your belongings. Otavalo is relatively safe, but pickpockets still exist. Prices are negotiable! If you don’t get an offer you like, just move on – you might see the same item a few stalls down. This is a rescue centre which focuses on rehabilitating birds of prey. You’ll see various owls, eagles, hawks, falcons – and the critically endangered Andean condor, Ecuador’s national symbol. Free flight demonstrations are twice a day, Wed – Sun (11.30am and 3.30pm when I was there). Admission is about $5. Read more about my visit to Parque Condor here. How to get there: Walking from Otavalo is a steep uphill climb and will probably take you at least an hour. A taxi costs $4 one way. Tips: The signs and flight demonstration are mostly in Spanish. I’m not sure if the Otavalo tour operators offer trips to Parque Condor, but might be worth checking out if you don’t speak Spanish. They’re generally located around the Plaza de Ponchos (where the market is). 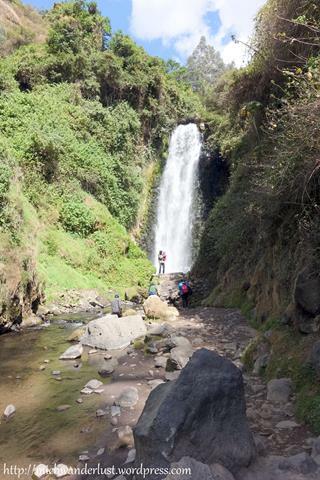 Located in the Peguche community just outside Otavalo, these impressive waterfalls are part of a reserve managed by the local indigenous community. The picture above was taken during the dry season – it’s much more impressive during the rainy season (roughly October – May)! Admission is free, although donations are encouraged. Read more about my visit to the Peguche waterfalls here. How to get there: You can take a bus from Otavalo ($0.30, about a 10-minute ride). Or you can take a taxi, which should cost around $2-3. It gets pretty crowded on Saturdays (which is when the bulk of tourists visit Otavalo because of the market). Go during the week if you can, when it’s much quieter. Don’t take a dip in the water – it may look crystal clear, but it’s not too clean as the villagers wash their clothes in it. You can hike around the crater rim – the trail is 14km long and takes around 5 hours on average. You can also take a boat-ride around the lake if you don’t fancy a hike. Bring some food and make it a picnic! Read more about my visit to the Laguna de Cuicocha here. How to get there: You can take a taxi from Otavalo (ask your hotel/hostel how much it’ll cost), or you can save a little by taking a local bus to Quiroga and taking a taxi from there. 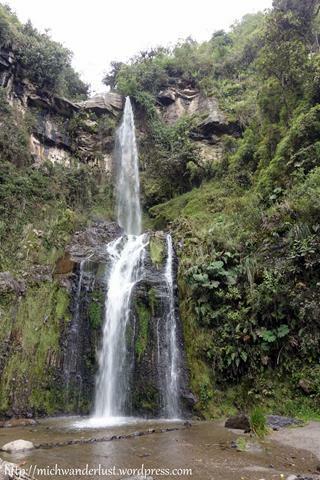 It’s about 30 minutes from Otavalo by taxi. Set aside at least 5 hours for the hike – more, if you want to do it at a leisurely pace and take more photos! Go as early as possible, because it tends to get cloudy in the afternoon (the above pictures were taken between 10am and 1pm). Bring water and rain gear if you’re going on the hike. High in the páramo above Otavalo, these lakes have an ethereal feel about them. They’re popular on weekends with Ecuadoreans looking to picnic or go camping, but it’s much quieter in the middle of the week. There are 3 lakes and they’re huge, so set aside at least a couple of hours if you intend to go hiking. 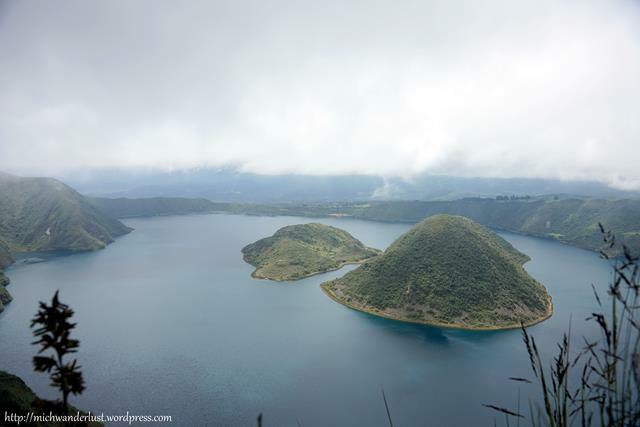 You can also climb the inactive Fuya Fuya volcano which looms over the big lake – it’s a steep uphill climb which should take around 2 hours. Read more about my visit to the Lagunas de Mojanda here. How to get there: You can take a taxi from Otavalo (probably around $15, but do confirm with your hotel/hostel). I’ve asked around a bit but none of the locals I spoke to were aware of public transport options. It’s cold here! Wrap up well. 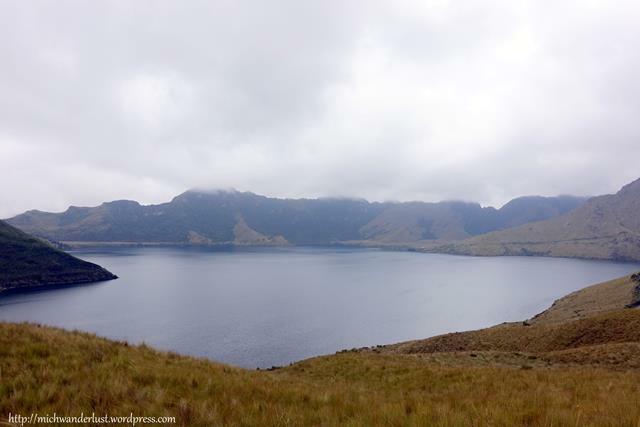 Acclimatise yourself to the altitude before attempting the Fuya Fuya climb (it stands at 4263m above sea level). Bring rain gear and (in the rainy season) rain boots are a good idea. Far less famous than its Peguche counterpart (No. 3 above), this is truly a hidden gem. You have a hike a bit to get there, but you’ll have it all to yourself except for some locals. Read more about my visit to the Taxopamba Waterfalls here. How to get there: Take a taxi to the Mojandita community (which should cost no more than $3-4). You’ll see signs for the “Cascada de Taxopamba” trail as you enter the community. Tips: The trail isn’t terribly well-marked. Be prepared to ask for directions. Get a tour of this museum, conveniently located near the city centre, which showcases local indigenous culture. You can get a ritual cleansing done and take a look at the historical site, which was a textiles factory for hundreds of years. They also have a little shop where they sell woven goods made right there for very reasonable prices. Read more about my visit to Museo Otavalango here. How to get there: It’s a 10-minute walk from the city centre (you can find it on Google Maps). Or you can take a taxi ($1.25 / $1.50). Tips: Call in advance if you need an English-speaking guide. You can try your luck if you just walk-in, but no guarantees they’ll have one available! Pay a visit to one of the few remaining backstrap weavers in Ecuador. Miguel has been doing this since he was a young child. He and his small team do everything from cleaning unspun wool down to weaving the final products, and you can take a tour of their workshop for free! You can then take a leisurely look at their small shop adjoining the workshop, if you wish, and buy anything that catches your eye. Credit cards are accepted. Read more about my visit to the workshop here. How to get there: You can take a taxi from Otavalo ($5) or take a local bus to Agato and ask around for directions to the workshop. Tips: Call or email in advance to make sure they’re open when you plan to visit. Note that Miguel speaks English, but not all his family do. Just a short bus ride from Otavalo, this city is famous for its leather goods. Sleepier than Otavalo, it’s a nice place to chill out for a couple of hours and go (window-)shopping for any leather goods you may need – bags, jackets, shoes, etc. Plus, the Museo de las Culturas is worth checking out. This museum is about local indigenous culture, and admission is free and comes with a guided tour. It’s near the main town square (above). Read more about my visit to Cotacachi here. How to get there: It’s a 20-minute bus ride from Otavalo ($0.35). You can also take a taxi there – ask your hotel / hostel how much it costs. Did you know? Cotacachi is home to a community of North American retirees who adore the low cost of living in Ecuador and laid-back vibe of Cotacachi. 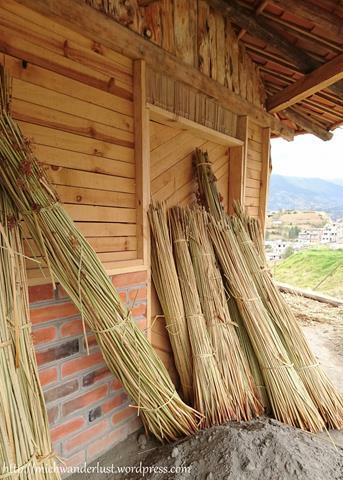 San Rafael, an indigenous community about 10 minutes by bus from Otavalo, is famous for its totora crafts. Totora is a type of reed that grows in the nearby lake, Laguna de San Pablo. The villagers make mattresses, baskets and other products from it. There are totora shops, but we came across this house (above) right next to the Pan-American Highway. The guy showed us some baskets and miniature llamas he’d made, and said he was thinking about setting up a display. So you might just see it if you walk along the road! You can also get boat-rides around Laguna de San Pablo here. Read more about my visit to San Rafael here. Tips: Don’t expect people in the community to speak English. If you don’t know Spanish at all, consider going with a tour operator from Otavalo. Ibarra, the “white city” and the largest city in northern Ecuador, is about 45 mins away from Otavalo. A popular weekend getaway for local families is the Laguna Yahuarcocha, 3km from Ibarra. Here, you can stroll along the lake, eat fried tilapia fresh from the lake (fish is always fried here), or take paddle-boats for a spin on the lake. There are also regular motor-boats, playgrounds for children, etc. – plenty of things to keep the family occupied for an afternoon! Read more about my visit to Laguna Yahuarcocha here. How to get there: Take a bus to Ibarra (45 minutes) and then a taxi (around $3) or another bus going to the lake. Tips: It gets crowded on weekends. If you can, go during the week. If you’re looking to brush up on your Spanish and don’t want to linger too long in the eternally crowded Quito, Otavalo is a pretty good choice. Plus, Spanish lessons in Otavalo are substantially cheaper than in Quito! Mundo Andino Spanish School offers a variety of packages, including intensive private lessons with homestays. They’re a small outfit and very flexible, so just tell them what you want to do and they’ll work something out. I did 5 days of intensive lessons (9am to 1pm) followed by cultural activities (2pm to 4/5pm), which was super fun. Shenandoah Pie Shop (as the name suggests) serves the most delicious pies. Most of my meals in Otavalo were with my host families’ homes, but I kept returning to Shenandoah Pie Shop whenever I was in Otavalo. 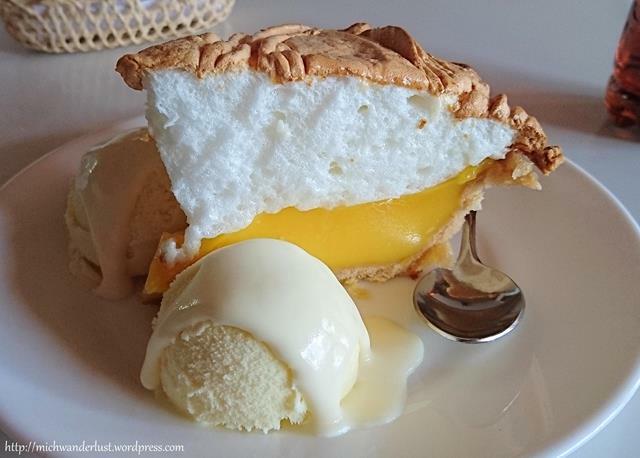 A slice of pie is just $2, and for another $2 you get 2 scoops of vanilla ice cream. You can also get 1 scoop for $1. It’s not a very fancy place (and they don’t have wi-fi), but it’s worth it. How to get there: It’s strategically located along the Plaza de Ponchos (where the market is), so just walk around the edges of the square and look out for the sign! Tips: Try the apple pie. I’ve tried a few of the flavours (offhand – blackberry, chocolate, passionfruit) and the apple pie is the best. And it’s better with ice cream. 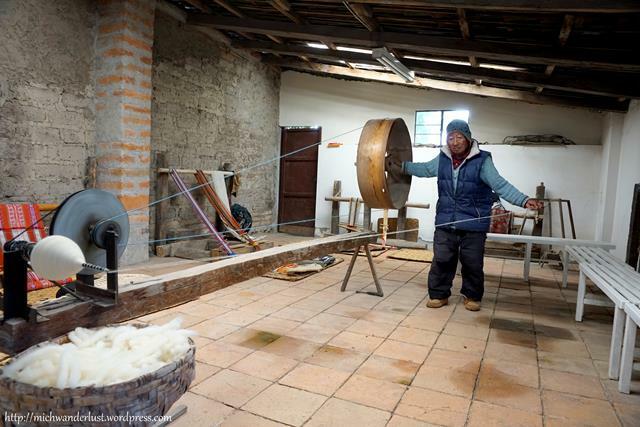 In Atuntaqui, a community outside of Otavalo, you’ll find the Museo Fabrica Imbabura. It’s an old textiles factory converted to a museum and showcases the history of textile-making in Atuntaqui. I didn’t visit this, but it was recommended by my Spanish teacher. How to get there: Bus from Otavalo or taxi (I think it’s about $5, but confirm with your hotel/hostel). 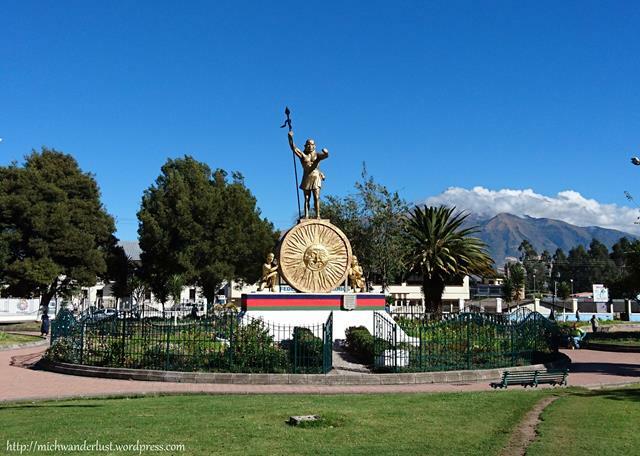 This is a full-day round-trip tour from Otavalo. The train will make stops at a number of iconic cities (Ibarra, San Roque, Andrade Marin, and Hoja Blanca) before ending up at Salinas de Ibarra. You’ll have a bilingual tour guide and return by bus to Otavalo. The tour departs Friday, Saturday, Sunday and public holidays. A standard ticket costs $53. I didn’t try this because it was out of my budget, but it sounds really interesting! A detailed itinerary is here. 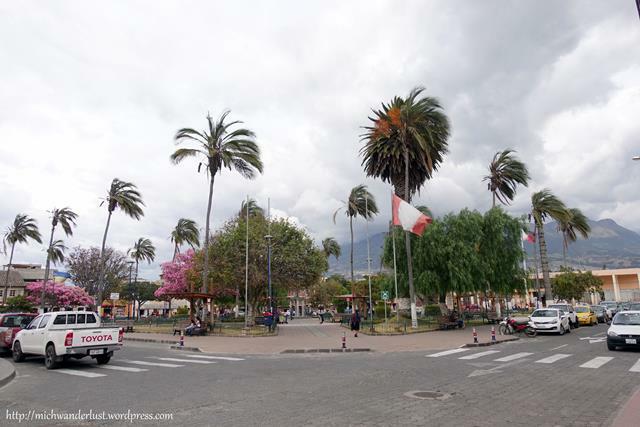 Have you been to Otavalo? Is there anything you’d like to add to this list? Let me know in the comments! Beautiful post! Brings back so many memories of my country! Thank you! Ecuador is an incredible country, I’d go back in a heartbeat if I could! Yup it’s a really nice hike / day out! Wish I had scenic getaways back home! We loved living in Ecuador – that is, until our visa expired and we had to leave. I’ll admit it’s bittersweet to read your story because you’ve done a good job and Otavalo was high on our list of places we wanted to see. Maybe someday we’ll have the chance to return….. Yes Otavalo is in a beautiful part of Ecuador. I have seen the markets and the waterfall! Thanks for these tips. Forced to stop in Otavalo for 5 extra days due to daughter with 2 broken wrists so Ned sent over your blog. Plan to do pie shop and bird show today. 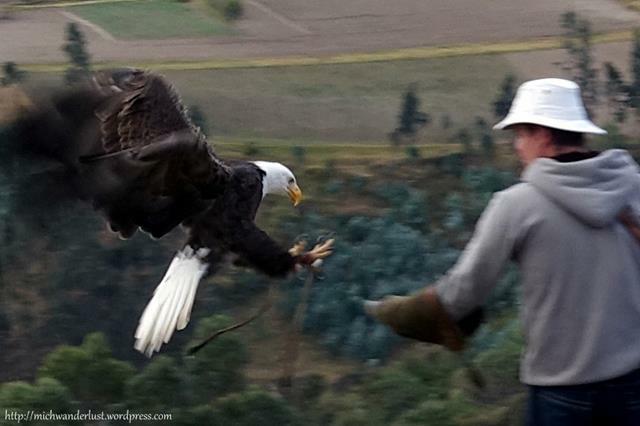 Birds display open Wed to Sun only in case anyone interested. Oh no, sorry to hear about your daughter’s injury, Tara 🙁 Thanks for the tip about the bird show, will update the post accordingly. Hope you enjoy it! I love your tips and suggestions, Michelle! How many days would you recommend staying in Otavalo? Hey Agness, I guess it depends on how much time you have to play with, but there’s definitely enough to keep you occupied for at least 3-4 days especially if you’re into culture and hiking 🙂 Thanks for stopping by!